New Year, New Me. Just Kidding, I’m Still Grumpy and Indian. AND I STILL LOVE SUGAR. AHHHHHHHHHHHHHHHHHHHH!!!!!!!!!!! Guys, I have been on a steady diet of cookies, maple syrup, chocolate chip Belgian waffles, peanut butter and Neuhaus chocolates since, like, I don’t even know when. I’ve lost all sense of time. I can’t grasp simple concepts anymore. Which one is the minute hand and which one is the hour hand? What’s a deductible? Can someone teach me how to properly use my Twitter? I can teach you how to Dougie in return. Me for the past few weeks. Except without the hat. That’s the only difference. All of these problems are, very likely, sugar-induced. And I just don’t give a damn. Eventually I’ll probably wake up and start force-feeding myself whole grains and bell peppers again, but for now I’ll just stick to congratulating myself on begrudgingly taking down daily glasses of V-8 [with my aforementioned Belgian waffles]. So anyway, HAPPY NEW YEAR! 2014– wild, right? Maybe? I’m personally hoping it’s a much calmer year than the last. Here’s to a(n) emergency room/ulcer/scary crazy folk/general overall disaster and tragedy-free year for ALL of us, people! I really do wish you all the very best and cannot thank you enough for continuing to read and like this blog. One of my best friends touched my heart and made me tear up a little when he thanked me for my last post, in which I talked about the importance of celebration and gratitude. Moments like that are exactly what keep me celebrating and keep me grateful. So here’s to popping the literal or figurative bubbly all crazy year, loves. And if you need a little something to accompany all of that Cristal, why not try these easy-peasy cookies? FIVE ingredients, a MILLION fans. Maybe not a million. In my case it was like twenty. But that’s because I only gave these to twenty people. That’s a 100% success rating, so it might as well be a million people. Feel me? 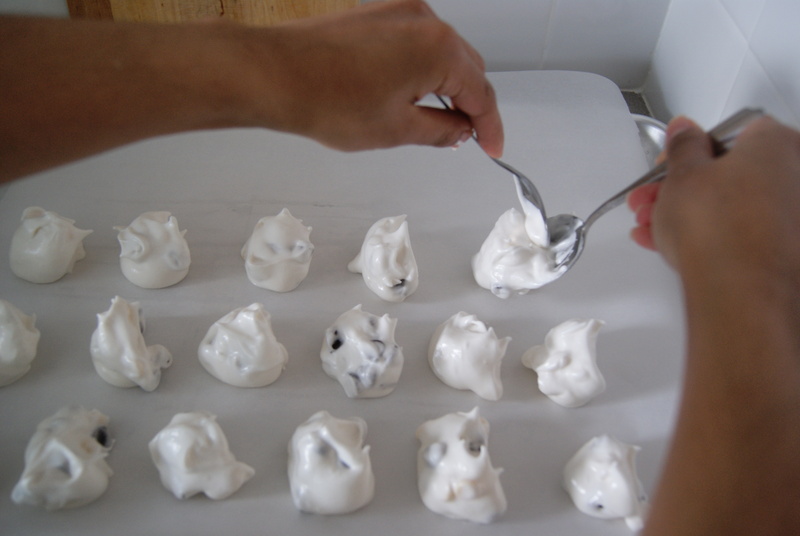 Let’s make some easy meringues. Preheat your oven to 300°F and cover a large cookie sheet with parchment paper. 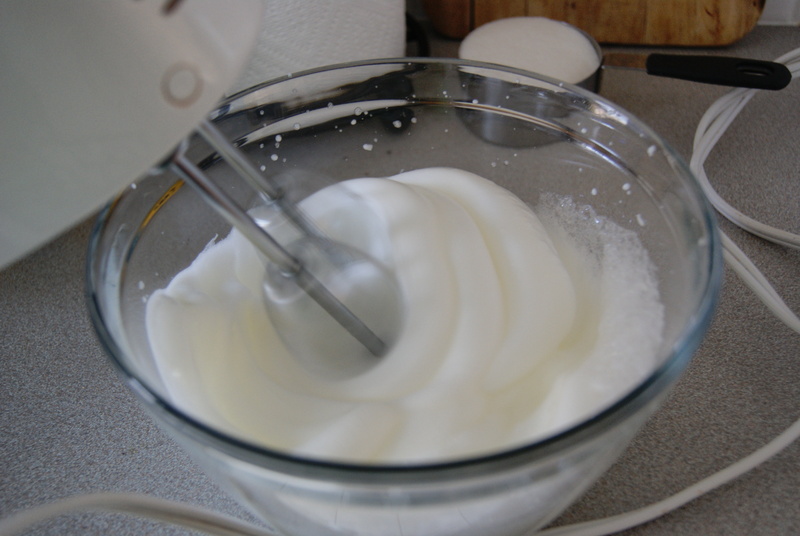 Using a hand mixer or stand mixer, beat egg whites on high until soft peaks begin to form. I think I’ve mentioned this before, but I’m going to stress it again: it is super important to be working with clean, dry instruments when making a meringue. 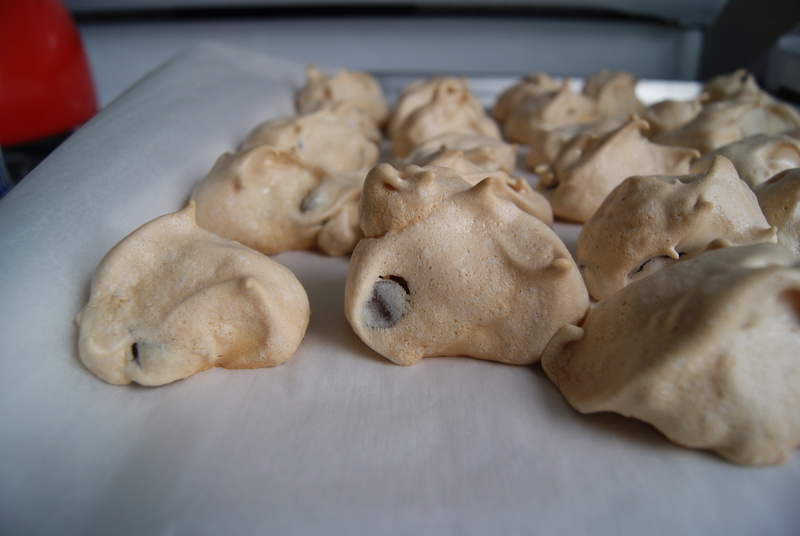 I am not calling you gross or anything, but even the slightest bit of moisture can ruin a meringue. When you’re happy with your peaks, gradually add in sugar, a little bit at a time, then beat in vanilla until your peaks are very stiff. The peaks should be so stiff that you’re able to hold the bowl almost completely upside-down without having any of your batter budge. 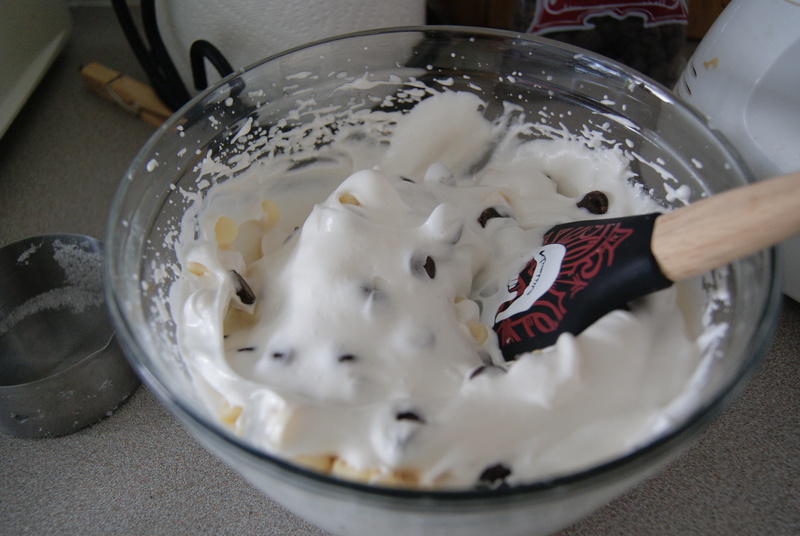 Do this slowly if you’d really like to test it, and if the batter starts to slide down, keep beating. When you’re satisfied, gently fold in your chocolate chips. You can keep the cookies fairly close together since they won’t really spread. 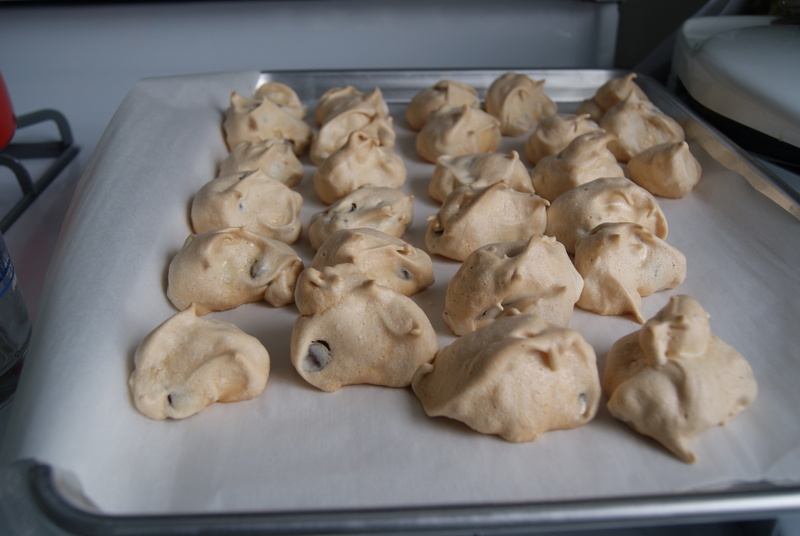 Bake for 35 to 45 minutes, or just until the cookies are slightly browned and don’t look shiny. Mine took about 37 minutes to get there. Cute, right? And I’m betting that if you’re a sugar fiend like I am you probably have all of the ingredients on hand. ALSO these aren’t terribly bad for you– no butter, oil or egg yolks necessary! I think I may have accidentally convinced multiple people that this was a health food. Don’t do that. Especially since these taste anything but healthy. They’re crunchy on the outside, with a light, dreamy-creamy inside. Given that these are one-bowl-baking cookies, and given that there are so few ingredients, there really aren’t any excuses not to make them. Unless you’ve already had too much sugar. Um…but even then…. ← Leggo My Holiday Depression. That Was Bad. It’s A Post About Waffle Cookies.